A little while ago there was some discussion of the “new” summit G/DC-008. One question was over whether or not the AZ crosses the border onto access land. I believe one activator made a trip to investigate this. My approach (call me lazy if you like) was to use my computer. 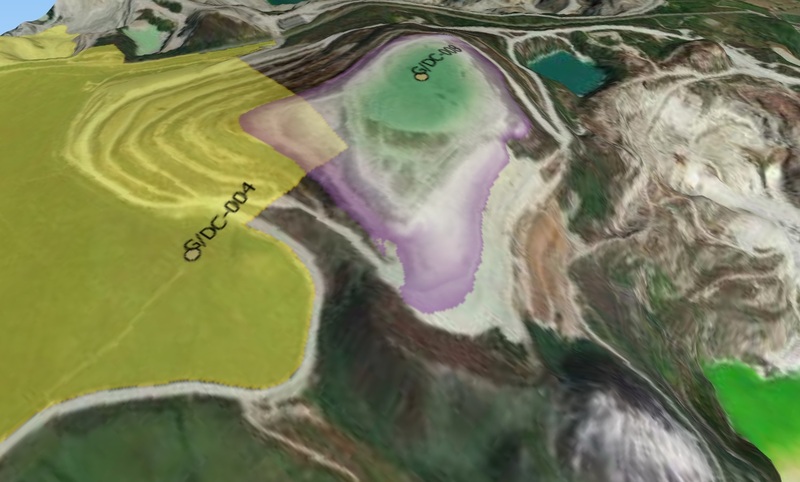 The AZ is shaded from green at the summit to purple at the -25m mark. The Access land is coloured yellow and it can be seen that the AZ does indeed overlap it. The original DC-004 position is also given. 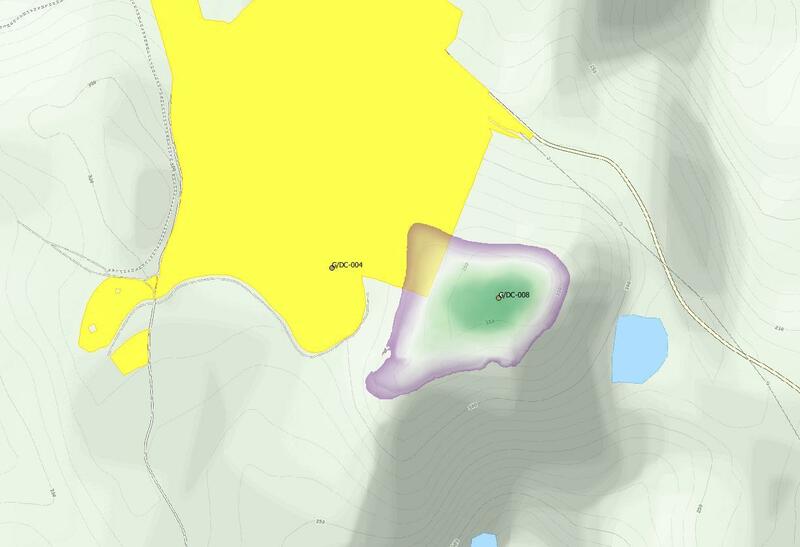 Just for clarification - the yellow area is public access land, is that correct? So the small almost rectangular, overlap is where one would try to operate from (if physically accessible). Yes Ed, that is correct. Thanks Simon for posting this. This is very useful. I think a GPS is required to know if you are in that purple/yellow area. As my and my dad Tom M1EYP don’t have a GPS it will be helpful when this summit becomes valid for someone to go and activate this with a GPS and record the route in this and then post an activation report describing the route taken either on the reflector or summit page so that people who don’t have a GPS know how to get into that yellow/purple section. It may the worth once this summit does become valid to find out if you can get permission for the true summit, if they refuse it is not the end of the world as you can still get to the activation zone via access land. In case it is of help to anyone the 8-figure OS reference for the south east corner of the Access land (in the overlap area) is SW99935747 (or WGS84 for some GPS users: -4.8155, 50.3830). The length of the short side of the overlap (i.e. approximately to the west) is 68m and the long side (approximately north) 177m. In total the overlap area is 1.7 hectares. Use the GPS in your phone in that case. Since there are still a lot of people who cannot be bothered with GPS, an alternative would be to give a compass bearing and distance from the Hensbarrow Beacon trig point. It looks to me like 200 paces on a bearing of 090 (i.e. east) would put you in the AZ while still in the original access land. Pacing on a compass bearing might seem a rough and ready way of proceding, but if it is good enough to get you safely off the summit of Ben Nevis in a whiteout it is good enough for Hensbarrow Downs! Good point Brian. I make it about 191m at 102 deg to grid north for the start of the AZ, and about 251m for the far edge of the access land. But my paces get shorter as I go up hill! I’ve got GPS Jimmy. And so have you. I have got both OS 1:25,000 Map and Google Map apps on my phone which are useful, but I’ve that these aren’t very reliable with working out exactly where you are when you are outdoors even with both mobile data and GPS turned on.
. It looks to me like 200 paces on a bearing of 090 (i.e. east) would put you in the AZ while still in the original access land. As I remember, it was like this in that direction about 5 years ago! And what isn’t rocks is all spikey prickly stuff. There is a path but that loops round to the north from the trig point. The spoil heap was looking better when I activated Hensbarrow Beacon in October 2014 - also viewed from the trig point. It’s a long way to go to maintain my SOTA all England Complete tally. You can’t really blame the meddlers for this one, unlike Muncaster Fell - another one I will need to visit, and despite living in the north of England a 3.5 hour drive to get to it… I was very grateful to G4OOE and M0PYG for activating this one on 80m this last week. PS Thank to Simon for the useful detailed information about the topography and it’s effect on the AZ. I agree with your findings having undertaken a study evaluating OS data using AutoCAD. I also made a site visit on Saturday 18th February 2017 and reported to the MT through the G Association Manager, Jimmy M0HGY. "I went to Hensbarrow Downs on Saturday and checked out the new summit area. After a brief visit to Hensbarrow Beacon to check the GPS was more or less set (the reading taken was 313m), I climbed up to the new summit. There I located the flat rock that RHB indicate is the highest point, though there are several flat rocks around the area. I checked the reading and it gave me 365m which equates well to the 364.6m RHB figure. I took a couple of photos to show the maturity of the vegetation, which is well established and although it appears to have been accessed (quad bike tracks), there was no evidence of recent landscaping work. 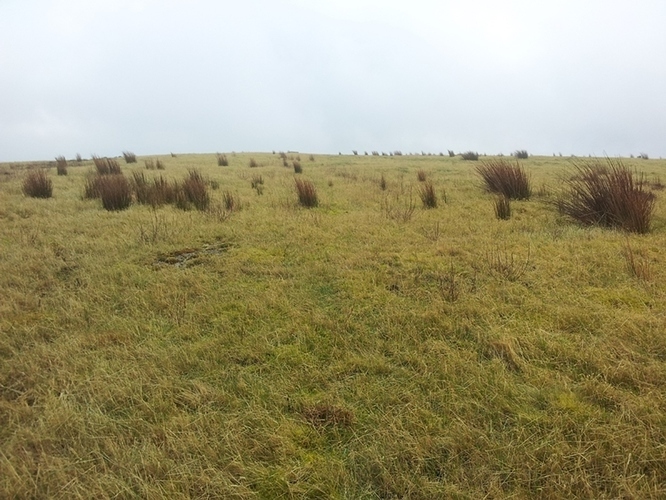 The summit area is a mixture of grass and moss with clumps of reeds. It is quite damp with a few small shallow pools, but the ground is generally firm. To try to establish the edge of the OA land, I inserted the 1:25000 OS map image into my CAD software and set it up against a 1000 metre x 1000 metre grid. This gave me an approximate point where the OA land boundary turns at a right angle and a line heading east of north along the boundary stones indicated on the 1:25000 OS map. I took this line even though the OS appears to suggest the actual boundary is slightly further east (closer to the summit) so that I had a small amount of leeway built in. I checked this against the best OS data that is generally available - the standard that I use for producing site plans, location plans and conveyance plans at scales of up to 1:500. The correlation was quite good. However, I have found such data to be out on many occasions, so bear that in mind when you draw your conclusions on this matter. The CAD software gave me grid references for the corner of the OA land and points along the boundary at 25m intervals towards grid north. 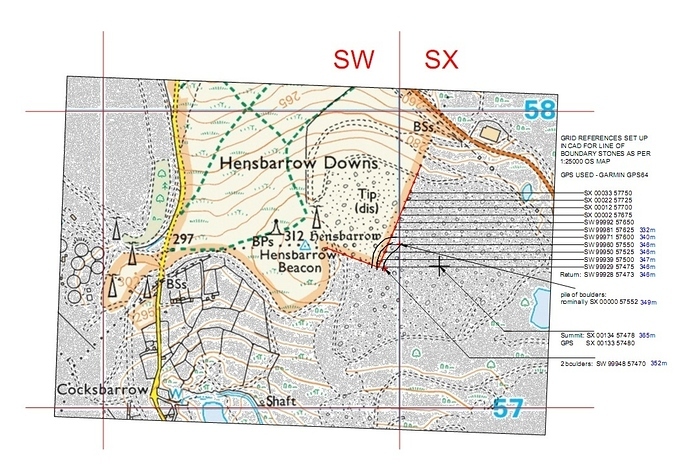 Referring to the information that I had marked up on a plan, I walked down the hill to locate the point where the OA land boundary returns (SW99928 57473) where the height reading was 346m. 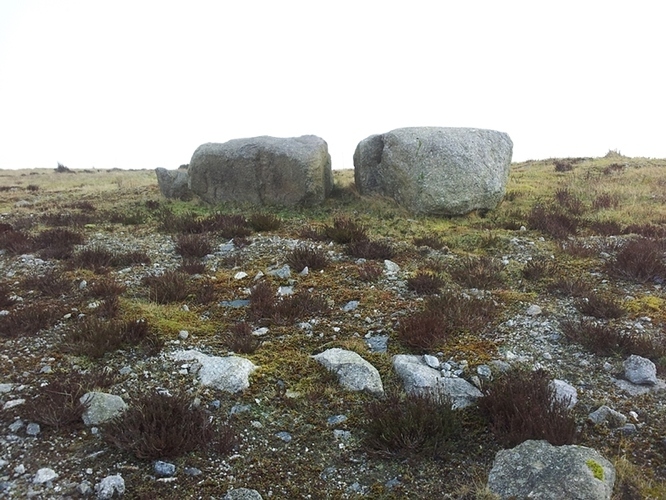 Close to this point at SW99948 57470 there are two large boulders which may indicate the actual OA boundary on the ground. I cannot see any other purpose for them and they have obviously been placed there. The height varied a little along the boundary line around 346m, until it began to fall off. 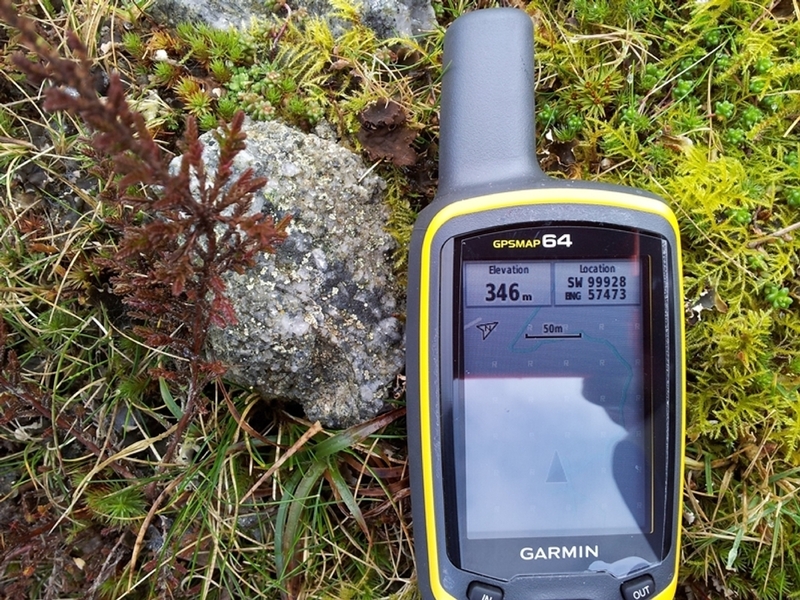 After crossing a track the GPS reading was 332m, so I did not take any readings north of that point. After this I returned back up the hill to take a random series of readings along the 340m and 345m contours. I also took some at 350m, though the heights taken on the boundary indicated that these were outside the OA land. Above 350m the gradient reduces and the summit is a flat expanse several hundred metres across. At SX00000 57552 outside of the OA land there are a quantity of boulders. I would speculate that these may have been intended for marking the boundary, but if the OA land is due to expand (again speculation), then they would not be required. 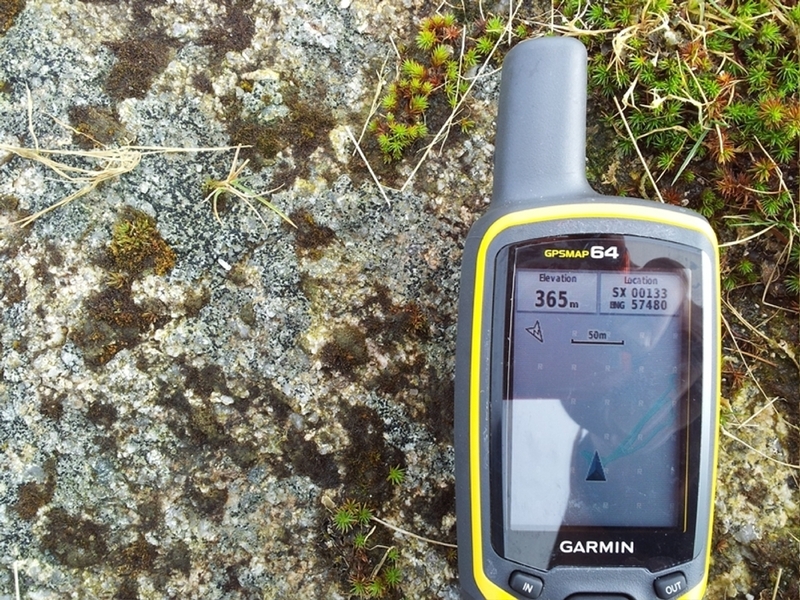 Before leaving the site I returned to the summit and checked the GPS reading. You will note that my £250 GPS does not quite make the grade against RHB’s £8,000 piece of kit. It did however give me 312m back on Hensbarrow Beacon when I returned to the car. I attach the marked up plan showing the survey results. The three curved lines close to the angle in the boundary of the OA land are the 340m, 345m and 350m contours. Again, bear in mind the consumer grade equipment used to obtain these lines. I would draw everyone’s attention to the lack of any notable landscape features on the north-west / west side of the hill. In mist it would be extremely easy to become disorientated and a GPS would therefore be invaluable. Work is continuing some distance south of the new summit, but in poor visibility it would be possible to wander off in completely the wrong direction, so it must be considered a hazard under such conditions. Furthermore, to the south-west of the summit the ground is still terraced and quite steep, as can be seen from the photo taken from Hensbarrow Beacon. I did not investigate the east side of the hill. Given that the crossover between the OA land and the AZ is quite small (some 32m deep at most along a boundary length of around 110m) and the lack of features, I would suggest that using a GPS is the only way to ensure compliance with the SOTA General Rules. The weather cleared while I was on the hill and I was in full view of the road for well over an hour. A couple of workers were seen walking down to the road on the access track to the works west of the road. However, no-one came up the hill to enquire as to what I was doing. The vehicular access tracks are still in regular use. To get to the summit easily, I used the footpath running north from Hensbarrow Beacon keeping to the east side of the fence. After some 300m the path dropped down and turned right through a low rocky outcrop. This brought me immediately to a wire fence where I turned right, passing by the side of a metal road gate to continue on the track beyond. This track then joins the wider track that runs along the south side of the OA land. Here the track is within the OA land up to the next track off left, which is the one to take before striking off right and up the hill. Evidence of very recent use was noted." 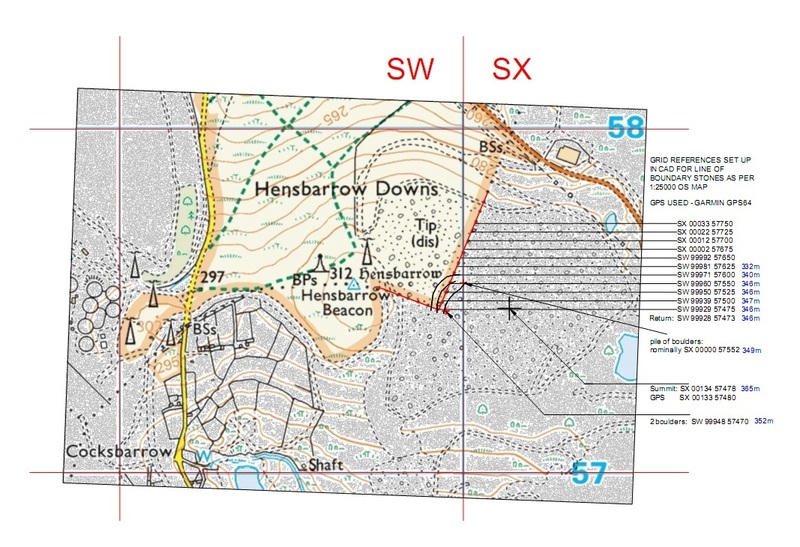 I hope this helps on the issue of Hensbarrow Downs. Take the information as you feel to be appropriate. Yes Gerald, I have access to Mastermap too, but I’m not licensed to reproduce it here. I can however confirm that the Access mapping layer corresponds quite well. In fact Mastermap comes out about 7m east at the return on that boundary. That’s the wrong direction to account for your overlap being so much smaller than mine. But like you say, it is only consumer grade GPS, and differencing two noisy measurements is never going to make it better. The Relative Hills guys use differential GPS survey-grade instruments of course, which likely have even better absolute accuracy than the LIDAR (although they agree within centimetres here). However, you can’t really beat airborne LIDAR, taking up to 100,000 measurements per second, with horizontal gridding down to 25cm, for measuring a slope like this. My main point is that people should know so much information is nowadays in the public domain. Just look at Magic and you sure to find something interesting, from the comfort of your own home! It is of course one thing to talk of bearings and distances on a map and quite another actually to go clambering through the gorse. Also I need not worry myself about the risk of getting chased away as a trespasser! I hope you enjoy your activation when the time comes. I have yet to make it to G/DC for SOTA. The two large boulders in your picture would seem to me, to be the place to setup. I doubt there would be a dispute with the land owner at that position as they would likely only have a gps to confirm their position. Thanks for the information Gerald. But aren’t those 2 boulders outside the access land? I will check my readings when I have it moment, but I seem to recall they may be just outside what I have estimated to be the OA boundary. It does seem strange for them to have been placed close to where Simon and I estimate the return to be. They do not appear to have any purpose other than to be a marker in an otherwise barren landscape. BTW, I was surprised to see how close the references were that Simon and I had estimated. Overall the fact that the AZ overlaps the OA land is good news. My daughter lives in St Austell and has told me that the land owners have a good relationship with the public. If we don’t abuse that relationship, then maybe one day the actual summit will be without restrictions. Okay I have been there, but it was only a brief visit and one with a definite purpose. Sitting up there with a pole and antenna for an hour or so is entirely different. I can confirm the reading I took was at SW99948 57470 (352m asl) which is around 22m from the point that I took to be the return on the OA land boundary. Incidentally, if the boulders do represent the corner of the OA land, just going downhill a few metres from them doesn’t guarantee that you are in the OA land as you could be south of them and so outside of the OA land. …quite another actually to go clambering through the gorse. The landscape is virtually featureless. Gorse - maybe sometime in the future when the natural environment establishes itself. You can see what to expect from the photographs I posted. In walking the hill to take readings I often had to stop and evaluate where I was relative to where I had estimated the boundary to be. It looks to me like 200 paces on a bearing of 090 (i.e. east) would put you in the AZ while still in the original access land. Unfortunately this is totally impractical on the ground. You would need to have the ability to hover over the ground at a height to clear any obstacles on the direct path. The landscaping does not extend to the foot of Hensbarrow Beacon. We can debate accuracy until the cows come home, but for me life is too short to worry about this when there is no clear definition of the boundary on the ground. My opinion is that if you can demonstrate that you have made a reasonable attempt to check that you are in the OA land, then that should be sufficient for our purposes. Incidentally, I took my Garmin car satnav up the hill with me and checked it against my GPS64 and was surprised to find they were within 1 metre. No doubt it is impractical, Gerald, but that isn’t a problem - I know what 200 yards looks like and I think that on a fine day I could reach a spot where I can estimate that distance on a reciprocal bearing to the beacon. Anyway, I shall be in the area in three weeks time and intend to activate the beacon so I will explore towards the Downs - I bet that if the Marilyn baggers haven’t already beaten a track to the top of the Downs, one will soon appear! Gorse - maybe sometime in the future when the natural environment establishes itself. The thing that surprised me on your photos was the lichenous state of some of the less kaolinised boulders, lichen doesn’t grow very quickly so those boulders had not been disturbed for possibly decades. In time the summit will no doubt resemble the moorlands of the area, with a thick carpet of heather and recumbent gorse making movement uncomfortably like the vicinity of the Watchcroft. The state of the ground on the beacon suggests that at some point it was worked over by tin streamers.